Porsche didn't come to Detroit, but Singer Vehicle Design did. 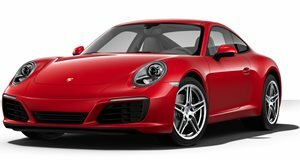 Porsche recently revealed the 2017 991.2 911 Carrera GTS and its many variants. The GTS may be the best 911 that money can buy without stepping up to the race-focused GT3 model, but it surprisingly was not the best 911 that debuted recently. Porsche didn't bother with the Detroit Auto Show this year, so Singer had the stage to itself. The two new cars, like other Singers, bear the name of the owners' cities of residence. So say hello to the red London coupe, and the blue Monaco coupe that graced the 2017 Detroit Auto Show with their presence. Mechanically, both cars seem to be very similar, according to the provided spec sheets. Both cars are propelled by 4.0-liter air-cooled flat-six engines built by famous engine builder, Ed Pink. The power from the engines goes through a modified Getrag G50 manual transmission from a 964 911. The suspension is supplied by Ohlins and the brakes are Brembo units. These cars may look like classic 911 models, but they are made from extremely light carbon fiber panels. The London coupe uses Michelin Pilot Competition slicks, while the Monaco coupe has Michelin Pilot Sport PS2s. Each car was specifically spec'd out by its owner, meaning that no Singer is exactly like another. Both cars have unique, retro interiors with woven leather carbon fiber seats. Anyone who wants to see the cars can visit Michelin's booth at the Detroit Auto Show for what will likely be the last time these cars are on display before entering their owners' collections.